My good friend Ben Lee will soon be embarking on a very ambitious trip: traveling across the United States on a motorcycle, and visiting all 59 national parks in the process. I am proud of him for taking on this difficult goal, which will be a wonderful opportunity for great personal growth. The journey will include crossing the continental United States three times, driving through Canada to reach Alaska, and even flying to Hawaii, all while carrying only the possessions that will fit on a motorcycle. His travel plan will consist of three legs, which are represented on the map as red, blue, and green. Following the red route, he begins in Boston, goes North to visit Acadia National Park in Maine, and then travels generally West across the central part of the country. After driving South through California, he flies to Hawaii, and then returns to Southern California for the blue leg. This route takes him throughout the Southwest, then down into Texas, East across the Southern United States into Florida, and back up the East Coast again to New York. Finally, the green leg takes him West across the Northernmost reaches of the United States, from Washington State up into Canada, and finally ending with the parks in Alaska. 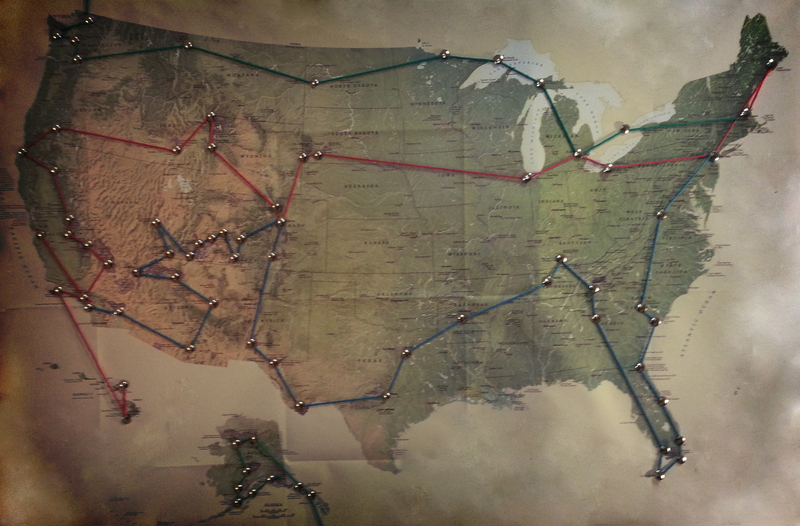 Ben is beginning this adventure on August 24, 2013, and he is expecting that it will take him a year or two to complete. He will be blogging when he has internet access, and you can track his progress, and find out more about his reasons behind this journey, at his website: www.59parks.com.